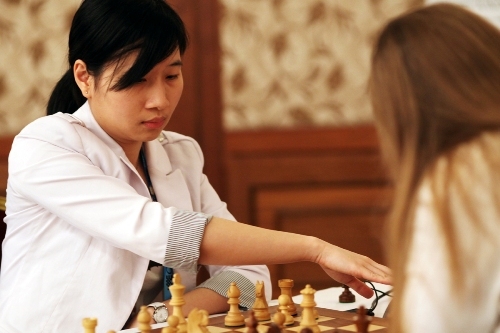 Here are three games from the new European Women’s Champion GM Hoang Thanh Trang. The game seemed to go all black’s way after winning the a-pawn but Houdini3.0 likes white until 30.Rxa5? Hoang kept pressing in an even ending. Kosteniuk played in enterprising gambit style for the attack but later this strategy backfired. The game seemed to go all black’s way after winning the a-pawn but Houdini30 likes white until 30.Rxa5? Black took the a-pawn and consolidated after white tried to smash down the queenside with 30.Rxa5? but failed. Hoang kept pressing in an even ending and eventually converted a nice R-R ending in model fashion. Black’s kingside pawn shield looks loose. What do you recommend for black? This is the big news of the week. 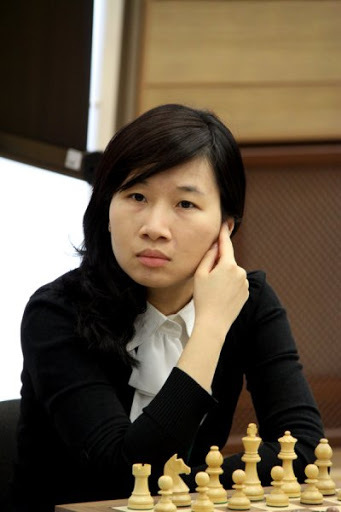 GM Hoang,Thanh Trang 9/11 took clear first and is the new champion. Here is GM Hoang’s rd8 victory, featuring some subtle RB-RN endgame play. Black has an active R+B tandem. What do you recommend for black? GMs Hoang,Thanh Trang and Gunina,Valentina tied for first with 6/7. Here is one of her games featuring strong technical play in a R-R ending. A walking tour with a guide. Black was not able to resist white’s technical play with the active rook and outside passed pawn. GM Hoang crushed the unusual black formation with precise aggressive play. The attack is well underway. What do you recommend for white? (More than acceptable solution). Here is Hoang’s rd7 game against Wojtaszek. Hoang defends with the active Leningrad Dutch but the …Rc8 idea and follow up gave white a free hand to press the position. Eventually white prevailed with a nice opposite color bishop attack. White has a better pawn structure but how to continue is a mystery. What do you suggest for white? Here is GM Hoang’s rd6 win. Hoang eventually ground out the win in a RRB-RRN ending that black came close to saving. White wants to push the a-pawn but cannot. What do you suggest for white now? Here is GM Hoang’s rd3 game. White played a tremendous attacking game using 1.Nf3 f5 2.d3!? against the Dutch. This poisonous line had already been recommended by Kindermann in his 2005 book on the Leningrad System. White has a lead in development and the natural plan is to attack. How should white proceed? The London System can be tricky to face. Here is GM Hoang’s rd2 win with the London System. Black has just played 26…Kf7 to defend the queen. How should white continue? 3 Canadians are playing in the Masters group. 3 Hungarians led by GM Hoang are playing. 5 Americans are playing led by the veteran GM Gata Kamsky. A massive group of English players including Budapest resident FM Mark Lyell are playing.